An international artist from County Tyrone, based in Kinvara County Galway, has returned this week from a six week stay in the French town of Grenay where he painted seven murals on cemetery walls with twenty four young people in a project that aims to inspire young adults who are unemployed or beginning their careers. 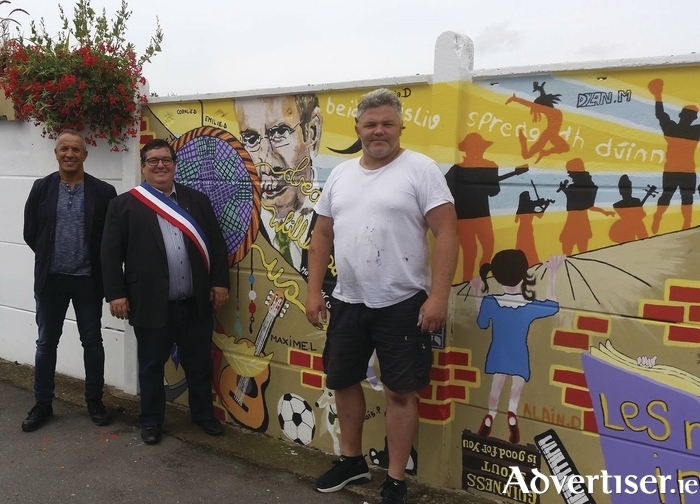 Jim McKee was awarded the contract for a second year running and was commissioned by the Mayor of Grenay, Mr Christian Champire to design and paint seven murals which covered themes such as peace, nature, love, dreams, imagination, animals and solidarity. Jim will return to Grenay on October 7 as special guest at a civic reception hosted by the Mayor and the murals will be officially launched with a local brass band performance and a plaque will be erected to mark the occasion. Jim will also perform at a concert in Grenay’s theatre that evening. People of the Tribes: Meet Isla.